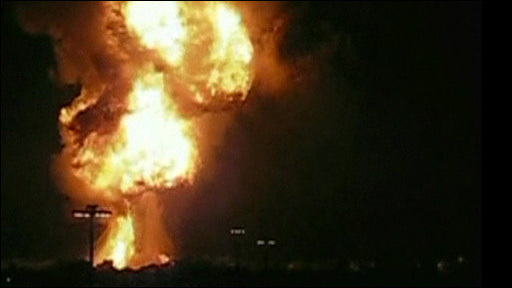 Thousands of people have been forced to flee their homes following an explosion at a propane gas plant in the north of the Canadian city of Toronto. A two-mile (3.2km) exclusion zone was set up as police ordered residents in the Keele and Wilson areas to leave. The series of explosions at 0350 local time (0850 BST) on Sunday also shut down one the city's busiest highways. A veteran firefighter died of a heart attack at the scene. There were no reports of serious injury. Witnesses described the sky lighting up in the glow of an enormous fireball before turning black with smoke, and some residents said the blast caused their houses to rock. "It was just a tremendous explosion and blew all the windows out of the house. I just managed to get out of there in time," local resident Robert Helman told the Associated Press news agency. Firefighters battled the blazes at the Sunrise Propane Industrial Gases facility for several hours. Toronto fire services division commander Bob O'Hallarn said that firefighters were close to extinguishing all the burning tanks, significantly reducing the risk of another explosion. "I think we were very lucky," he said. "There was a very large amount of fire when we arrived. It could have been much more serious." Mr O'Hallarn said he saw at least five badly damaged houses, adding that it could be hours before residents are allowed back to their homes.